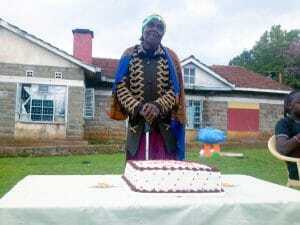 Dorcas, one of the guardians in the Molo Community, turned 89 recently. 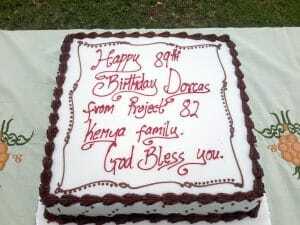 Our community and staff in Molo joined hands to celebrate Dorcas 89th Birthday. She is the guardian to two of our young men, Harrison and Joseph, who are exemplary young adults. 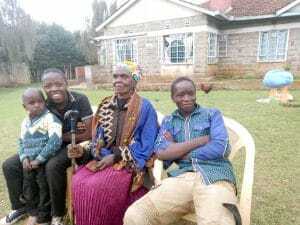 Dorcas has brought them up to be young men that people can look up to. The boys scored very well on their exams and live at Njoro Boarding school during the school year. They come home to Dorcas to celebrate the holidays. We wish you the Happiest Birthday, Dorcas! You are truly a lovely and loved mother. Thank you for your hard work in loving our community well and being the hands and feet to the children who live there. Happy Birthday to Dorcas — your love in Christ is making a difference in the lives of others!!! May your years be many and your health allow you to continue in service.